"Air cargo had its strongest performance since the rebound from the global financial crisis in 2010. Demand grew by 9.0%. That outpaced the industry-wide growth in both cargo capacity and in passenger demand. We saw improvements in load factors, yields and revenues. 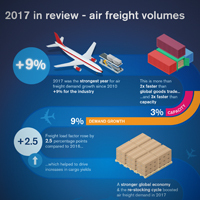 Air cargo is still a very tough and competitive business, but the developments in 2017 were the most positive that we have seen in a very long time," said Alexandre de Juniac, IATA’s Director General and CEO. "The outlook for air freight in 2018 is optimistic. Consumer confidence is buoyant. And we see growing strength in international e-commerce and the transport of time - and temperature-sensitive goods such as pharmaceuticals. Overall the pace of growth is expected to slow from the exceptional 9.0% of this year. But we still expect a very healthy 4.5% expansion of demand in 2018. Challenges remain, including the need for industry-wide evolution to more efficient processes. That will help improve customer satisfaction and capture market share as the expectations of shippers and consumers grow ever more demanding," said de Juniac. European airlines posted a 5.0% year-on-year increase in freight demand in December and a capacity rise of 3.2%. The strong performance in December boosted cargo volumes for the 2017 calendar year by 11.8% - the largest increase of all regions with the exception of Africa. Capacity in the region increased by 5.9% in the 2017 calendar year. This is consistent with Europe’s manufacturers’ export orders growing at their fastest pace on record. This is expected to support demand into the New Year.